Reputation can be a tricky. When someone is known to be good filmmaker, you assume most of their works will stack up to their previous projects. That's not the case with PONTYPOOL's author/screenwriter, Tony Burgess. His script for SEPTIC MAN is one of the most boring stories from the past year. There's hints of greatness, but none of it is utilized. A Canadian town has been undergoing some serious contamination issues forcing the town to evacuate. The people that are being infected by these diseases are shown to be shot if they come too close to the soldiers in order to prevent any further outbreak. There is a mysterious organization that hires septic man, Jack (Jesse David Brown), to stay behind and figure out what is going on with this outbreak and find a way to stop it. All things considered it sounds like it will be a cool movie. 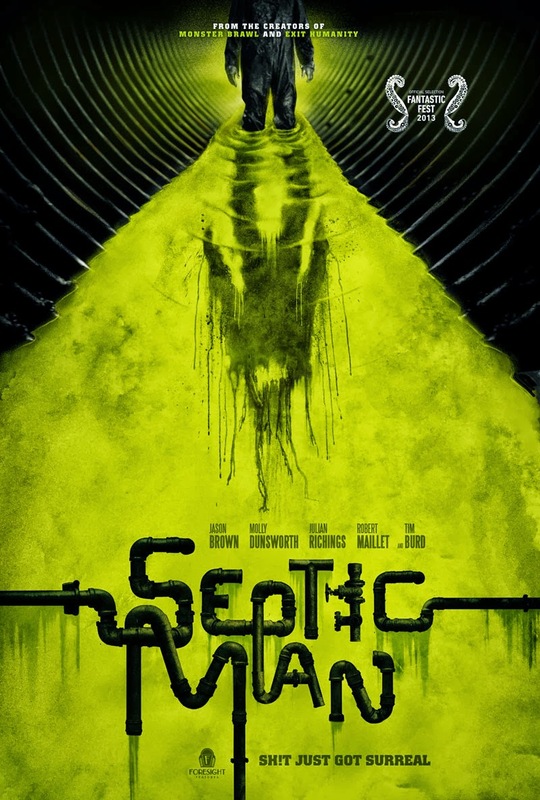 But just as Jack's transformation into Septic Man creature begins when he is trapped in a mysterious chambers under the treatment plant, and the movie begins transform into a boring mess that makes its run time wear out its welcome. It seems that the source of the contamination was in this particular chamber where a group of mysteriously French serial killers dump their bodies. It's at this point that the movie begins to show just how paper-thin and pointless its plot is. During the various and gratuitous scenes where Jack is slowly being transformed into the titular Septic Man, you have no clue as to how much time has passed, which you would assume would be important. You have no clue as to what the point who the two killers are. There are brief scenes with them explaining their relationship, but you never understand why they kill or anything beyond the fact that they’re creepy hillbillies because hillbillies are usually killers. The most egregious thing is the fact that there is absolutely no character arc for Jack beyond "he turns into a mutated man". Once you get the to the end of the movie, you don't really get a sense that there was a story that needed to be told. His wife Shelley, played by Molly Dunsworth, is also pretty useless. She's stuck being the sad, lonely wife, and while her actions at the end of the film are understandable, there's not much weight to her decision because we're not invested in her and Jack's relationship. If there is a redeeming quality of the movie is the score. Since Jesse David Brown who plays Jack isn't that great of an actor, the music ends up being the one to actually convey some sense of emotion in any given scene. The special effects with the beautiful/horrible images going on with Jack's face was grotesque, so I'm sure people into Cronenberg movies would really be into it. SEPTIC MAN fails at telling a story that keeps the audience engaged. It spends too much time in really on gross scenes, but seems to care very little about fleshing out the world or the characters.